I've come across two recent items that point to what we've all feared... the next wave of foreclosures is rapidly approaching Minnesota. While no corner of Minnesota has escaped unscathed from the from the foreclosure crisis, the urban areas of Minneapolis and St. Paul have been especially hard hit. HOWEVER... the next wave of foreclosures will be felt the most in the outer-ring suburbs of the Twin Cities and the counties that surround the TC metro area. The second item is an audio presentation from Dr. Jeff Crump, Professor of Housing at the University of Minnesota, who has studied the foreclosure issue for years. He has come to the same conclusion as John Patterson. You can hear Dr. Crump's presentation here. 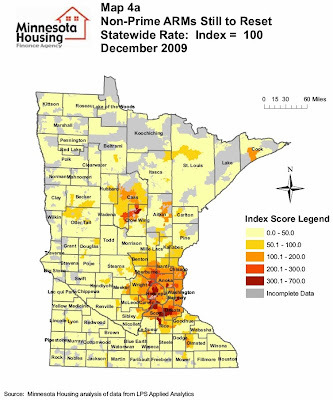 Combined with the less-than-stellar employment figures in the 'red zones' of John's "heat-map"... it's obvious that there are parts of Minnesota... like the suburban areas around the twin cities... and parts of Crow-Wing county... that are still in for quite a bit of pain. If you have an Adjustable Rate Mortgage... and you're not sure what will happen when the rate adjusts, or if you're struggling with payments now... don't delay, contact a Foreclosure Counselor through the Minnesota Home Ownership Center TODAY to learn about your options and steps to take to avoid a possible foreclosure. Waiting limits your options. 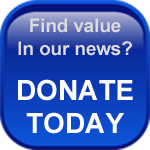 For information on how to contact your local, FREE Foreclosure Counselor, click here.